“Photo Tour” or “Tour” means the photography tour you wish to book. The workshop or photo tour cost includes the tuition fee only, unless otherwise stated in the workshop overview, description, or tour itinerary. All other expenses are the responsibility of the participants. The participant expressly acknowledges that the workshop or tour cost does not include any airfares, airport taxes, accommodation, transportation to and from the workshop or tour location, or items of a personal nature. The cost also excludes any insurance coverage for trip cancellation/interruption, travel accidents, travel delay, baggage delay, loss or theft, medical or hospitalization expenses. We recommend you contact your relevant insurer in relation to the above-mentioned insurance coverage, if required. 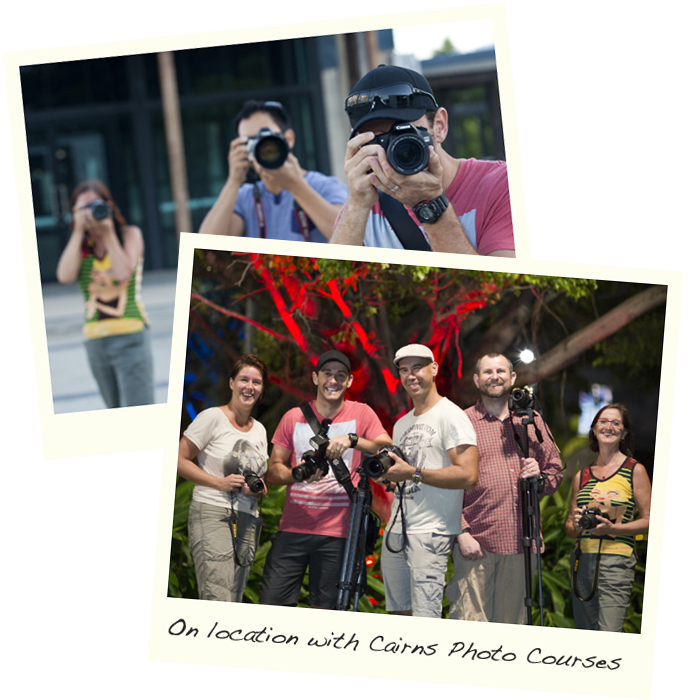 All participants are responsible for making there own way to the workshop unless otherwise specified by Cairns Photo Courses. All training and location based workshops commence promptly on time, as per the provided training outline. Groups awaiting departure will not wait for late participant arrivals. Late arrivals cannot be guaranteed inclusion on location based workshops, and no refunds or transfers shall be given once the workshop has commenced. To secure your booking, we require full payment at the time of booking, unless otherwise agreed by Cairns Photo Courses. A full refund is available if you cancel your workshop or photo tour booking more than 7 days prior to the start date. A 50% refund is provided when cancelled less than 7 days prior to the start date. No refunds will be provided for cancellations after the workshop or photo tour has commenced. If, once the workshop or tour has commenced, you are unable to attend due to illness or any other reason, we are unable to provide a refund or offer a transfer to another workshop or tour. If you’re unable to attend the workshop or photo tour originally booked and wish to be transferred to a future workshop or tour, you may do so subject to availability, however the same policy applies with regards to cancellations for any future workshops or tours. In the event that Cairns Photo Courses exercises it’s absolute discretion to cancel or postpone, any workshop or photo tour, for any reason whatsoever, including inadequate enrollment, logistical problems such as mechanical breakdown, strikes, wars, and acts of God (such as the possibility of extreme inclement weather), all fees and deposits paid will be refunded or transferred to an alternative workshop or tour of the participant’s choice within 12 months of the cancellation. We also reserve the right, in our absolute discretion, to cancel or postpone any workshop or tour, which may make operation of the workshop or tour, inadvisable or nonviable, including the safety and security of participants and their equipment. We expressly state that we will not be responsible for any costs associated with travel, accommodation, insurance or any other costs other than the workshop or tours cost that may be associated, either directly or indirectly, with the cancellation of the workshop or tour. If you are traveling to North Queensland to attend one of our workshops or photo tours, we recommend that you have personal health insurance and purchase emergency medical evacuation insurance and emergency medical expense coverage, and trip cancellation insurance, which, may, depending on the terms of your insurance, reimburse you for non-refundable airfare and trip cancellation fees should you have to cancel the trip due to personal or family illness. Life insurance, baggage loss and baggage delay reimbursement plus other coverage is also advisable. All our workshops and photo tours may be taken by anyone in good physical condition. For location based workshops or tours, you may be required to walk over irregular terrain, or for extended periods in regions, that may have hotter than usual temperatures and/or high levels of humidity, and carry equipment. You are therefore encouraged to get in shape by exercising regularly. Please call us if you have any questions about your ability to do a particular workshop or photo tour. Once your workshop or tour has started and it is necessary for you to leave the workshop or tour because it is beyond your physical level, please note that there will be no refunds for any unused portion of the workshop or photo tour. You must generally be in good health and it is vital that persons with medical problems make them known to us well before the workshop or photo tour begins. Although we carry a field safety kit containing general first aid items, it is understood that Cairns Photo Courses assumes no liability regarding provision of medical care or provision of medical advice in relation to the workshop or photo tour. Participants are urged to check their coverage to be sure it is adequate and to consult their physician prior to participating in the workshop or photo tour. This section defines our responsibility with respect to all of our workshops and photo tours. PLEASE READ IT CAREFULLY. Payment for your booking represents your acceptance of all Terms and Conditions outlined here, with our without your signature. By acceptance of these Terms and Conditions you hereby acknowledge and accept that Cairns Photo Courses has no liability for any damages, losses, or expenses of whatever cause or nature, including those resulting directly or indirectly from acts of God, detention, annoyance, weather, quarantines, strikes, civil disturbance, theft or criminal activity of any kind, government regulations, etc., over which it has no control. Without limiting the above paragraph, Cairns Photo Courses shall have no responsibility for additional expenses due to unforeseen delays caused by weather, theft or criminal activity of any kind, political disputes, acts of terrorism, strikes, sickness, failure of flights or other transportation to arrive or depart on time, and other causes beyond our control. In the unlikely event of any damage to a clients goods or materials, whether caused by negligence or otherwise, liability is limited to the cost of replacement of the materials & refund of any fees paid. No responsibility will be accepted by Cairns Photo Courses for indirect or consequential loss and it shall be the responsibility of the client to arrange adequate and appropriate insurance against the risk of any loss or damage. Cairns Photo Courses reserves the right to take photographic or film records of any of our workshops and photo tours, and may use any such records for promotional and/or commercial purposes without the requirement for a signed release from any participants captured in any digitally recorded media. Any training materials provided to participants are copyright protected Intellectual Property, under Australian and International Law, and may not be edited, altered, shared, distributed, posted online or given, loaned or sold to any person, including, any entity, company, charity, organization, or school for any purpose, without the express written permission of Cairns Photo Courses and the payment of any applicable royalty fees required. Other than the standard internet data usage, Cairns Photo Courses does not collect or use any of your personal information unless specifically authorized or permitted pursuant to the Privacy Act 1988. The information I have provided with my booking is true and correct and I understand that Cairns Photo Courses is relying on that information in allowing me to participate in the courses, workshop or photo tour. I certify that I have been advised of the inherent risks, if any, associated with the services provided and I voluntarily choose to participate in the workshop or photo tour, fully accepting that the materialization of any such risks may cause damage to my person or property. I acknowledge and agree that I have read and understood all of the Terms and Conditions in relation to my participation in the workshop or photo tour and the costs associated with the same. I unconditionally release and discharge Cairns Photo Courses from all liabilities, claims and causes of action that may arise from any act, omission, default, failure or error on the part of Cairns Photo Courses (including any negligent act, omission, default, failure or error) occurring wholly or partially during the course of the workshop or photo tour and including whilst in transit to or from the workshop or photo tour. I acknowledge and agree that this is in addition to any other release and indemnity provided by me by agreeing to the Terms and Conditions of my participation in the workshop or photo tour. I agree to indemnify and keep indemnified, Cairns Photo Courses from any liability, claim or cause of action that may be brought against Cairns Photo Courses as a result of or in connection with any act, omission, default, failure or error on the part of Cairns Photo Courses (including any negligent act, omission, default, failure or error) occurring wholly or partially during the course of the workshop or photo tour including transit to or from the workshop or photo tour. I hereby waive any right to claim and agree that Cairns Photo Courses will not be liable for any loss or damage, personal injury, death, economic loss or consequential loss whether in tort, in contract, under statute or otherwise for any default, failure, negligence or error on the part of Cairns Photo Courses. If despite of these Terms, if it is found, under lawful judgement, that Cairns Photo Courses is liable to compensate me, then such liability is limited to the cost of providing the service which the liability arises against. Where this document is signed by the Parent or Guardian of a minor (being a person under the age of 18 years) then the Parent/Guardian warrants that the information contained in this form is true and correct and personally covenants in terms of this waiver, release and indemnity. I have signed this document of my own free will and without any representation or inducement by Cairns Photo Courses, its agents or employees.